Mac DeMarco possesses an odd duality of character; simultaneously charming and offensive, DeMarco’s music bears a touching earnestness that has made him beloved by many. Yet, the singer/songwriter is more likely to share a lewd fart joke on stage than to offer an introspective thought, creating a playful persona that has further fueled his success. During live performances this playful abandon often leads to unexpected places, with the notion of boundaries seeming non-existent to DeMarco and his band. 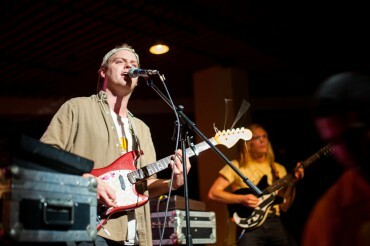 On Friday, Nov. 14, Mac DeMarco played a sold out show at the Hub, located on the University of California, Santa Barbara campus. This concert was presented and organized by the Associated Students Program Board. Contrary to many reports that have estimated the number in attendance to be around 100 audience members, the venue reached its capacity of 800 shortly before the beginning of DeMarco’s set. The night began with a performance by the band Paper Days, from Carlsbad, California. They describe themselves as a “dream rock quartet,” and they offered the audience at the Hub a strong set, featuring tracks from their Playground Dreams EP, which was released earlier this year. After a short intermission between performances, DeMarco stepped onstage dressed in an old white T-shirt featuring the characters of The Simpsons—which many noted as being the same outfit that he had worn at this year’s FYF Fest in Los Angeles, thus supporting the crowd’s understanding of his laid-back, slacker aesthetic. DeMarco paused to address the crowd, asking, “How many of y’all are trying to get f***ed up tonight?” Following a raucous response from the audience, DeMarco played “Blue Boy,” also from Salad Days. DeMarco then played “Cooking Up Something Good,” “Let Her Go,” and the track “Rock and Roll Night Club,” from his debut EP of the same name. As the set progressed, the crowd continued to respond well to DeMarco and his band. Members of the audience danced freely and laughed at DeMarco’s banter and the band’s onstage antics. At this point, DeMarco played “Ode to Viceroy,” a ballad dedicated to his favorite brand of cigarettes, followed by “I’m a Man” from the Rock and Roll Night Club EP. DeMarco then played a cover of Deep Purple’s “Smoke on the Water,” from 1972. After the cover, DeMarco donned a rubber chicken hat that seemed to appear from nowhere and continued to wear it throughout the next string of songs, which included “My Kind of Woman,” “Freaking Out The Neighborhood,” and “Chamber of Reflection.” DeMarco ended with “Still Together,” the final track from 2. Following the end of this track, DeMarco audaciously jumped into the audience in order to crowd-surf, causing various members of the audience to rush forward, lift him up, and pass him along until he had reached the center of the venue. At this point, DeMarco grabbed onto the ceiling beams in the middle of the Hub and, with assistance from the audience, hoisted himself up and sat on top of one of the beams. However, DeMarco took this as an opportunity to further scale the venue, climbing from beam to beam until he reached the second floor of the Hub, where he lifted himself up and over the railing to safety on the other side. Always an entertainer, DeMarco looked over the railing and waved to the audience below as the crowd cheered him on. But things soon took a turn for the worse. Once DeMarco walked down the stairs to the first floor of the Hub and climbed back on stage, a police officer grabbed him and escorted him out of the venue. Outside, an officer escorted DeMarco to the stairway near the entrance of the Music Department where he sat until he was placed inside of a squad car, which eventually drove him away. Although DeMarco was released later that night, the actions of the officers involved left many audience members questioning whether the police had acted appropriately in the situation. Despite the fracas at the end, and the varying opinions that may exist regarding the role played by the police in ending the show, Mac DeMarco’s performance was truly one of the most memorable the Hub has seen in recent years.